Recently a new tour launched in Miami. Not just any copy-cat tour but the ultimate blend of the Miami marvels--history, culture and of course, the food. Introducing the Miami Culinary Tours! Whether you're a visitor to Miami or a local resident, this tour is a must for foodies and cultural connoisseurs! Today I had the pleasure of taking this blended tour that touched on Cuban food, called Little Havana Food Tour. At 10am, we met in South Beach and boarded a clean van and as Guido, our driver, smoothly rolled on our tour guide, Grace, presented us with goodie bags, or in this case, foodie bags. She instructed us to take out certain items, open them in a particular order and to sip, whiff, and swallow. The taste and sensation was a preview of our upcoming food sampling. What a fabulous introduction! As Guido headed to Little Havana, Grace began the storytelling of the history of the first food item we were soon to try--a Cuban sandwich. Now as a Miami resident, I've eaten many Cuban Sandwiches but knew nothing of its history or the ingredients or the process in creating the medianoche, a slightly different version of the sandwich. Living in such close proximity, I have driven through Little Havana eyeing weathered signs for restaurants and bars and always wondered how long they existed, which ones offered time-honored Cuban food or traditional recipes with a slight twist. I was about to find out! At each stop we sat down and sampled the food while Grace shared the history of the building and the owners. A special treat was the fact that many owners were the original founders and were still working there, working on a Sunday and came out to meet us in person! A TIME MACHINEOur tour through Little Havana was a journey of Cuba past that presented pristine traditional recipe dishes. So when Heliodoro Coro, the 80-year old Cuban owner of the Pub Restaurant stepped out to meet us, and showed us vintage photos of his retaurant beginnings 60 years ago, I felt transported in a time machine. Don Heliodoro couldn't resist showing us momentos painted on the restaurant walls of when he opened his restaurant "The Chattanooga" in Havana offering Cuban, Chinese and Spanish food. Yes, that's right--the Chattanooga. That's a story in itself and I don't want to spoil all elements of surprise. You'll just have to ask Don Heliodoro. That personal connection between owner and customer, was notable all around. I was in awe. 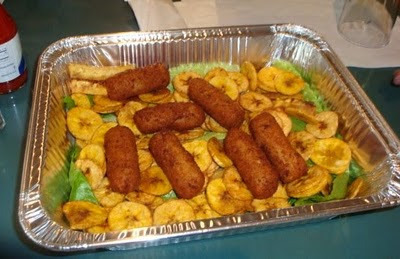 Our other stops included El Cristo for beef empanadas, and the Palacio de Jugos (Palace of Juices). Now in the grocery store, I've spotted names of tropical fruits like Mamey. Alas, I learned their origins, where they grow, and unmasked the flavors of these mysterious fruits. It was healthy and tasty. True to the website description we stopped at Domino Park and the Cigar Factory. At 11 in the morning on a Sunday, despite the pouring rain, elderly men sat on picnic-style tables under matching picnic roofs. Never have I sensed so much energy in a place full of 60, 70, 80 year old men. Dominoes is the national "sport" or game of Cuba and serious business to these men. But they obviously had fun. Maybe that's their secret to robust longevity. Strolling beneath store awnings, the rains could not overpower the waft of cigars. Hence we walked into the Cigar Factory and watched workers handroll the cigars. The tobacco leaves originate in Nicaragua, Dominican Republic and Ecuador. But the seeds come from Cuba. Below is a video of rolling the tips of the cigars. This factory has remained with the same family for generations. To round out the tour, desserts followed with a stop at Roma Bakery. Like all other stops, everything is made from scratch from the dough to the fillings and toppings to the gelato. And for the grand finale, a Mojito cocktail at the elegant Biltmore Hotel along with a brief walking tour. A perfect way to wind down and enjoy the rest of my Sunday! In taking tours in different cities and countries, the tour guide makes all the difference! Grace was the quintessential guide for this blended tour of history, culture and food. For starters Grace hails from a pedigree of culinary talent. 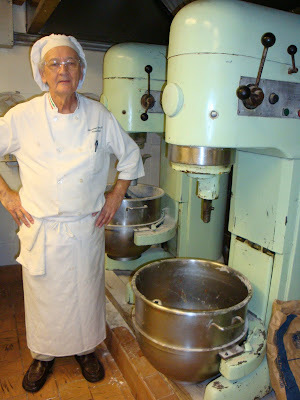 Her mother, Teresita, owns and operates a Bed & Breakfast in Buenos Aires, Argentina (http://www.gotraveltoargentina.com/). Even more impressive, Teresita teaches tourists how to cook and offers foodies tours as well (http://www.try2cook.com/). [I'm calling the airlines now to book my trip later this year!] Grace continued to entertain us with stories of cooking lessons and attempts from childhood through today. Most important, Grace enunciates well the English language, her second language. She spoke clearly and slowly so nothing was lost. In taking other tours, if the guide had a heavy accent, you lose the essence of the tour. Kudos to Grace! While her primary job is online marketing, her passion and committed hobby is learning to cook traditional or couture recipes to tasting various cuisine at local restaurants. She is a true foodie! Grace will offer her recommendations of best restaurants for ceviches, tapas, and other ethnic food. No matter whether it's a hole-in-the-wall establishment or five star restaurant, she is a well of knowledge! Grace is also the visionary founder and owner of this tour operation and I encourage anyone who's interested in culture and food to support this hard-working and talented entrepreneur! 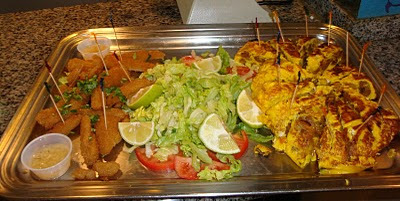 Keep in mind that the Little Havana food tour is not Cuban food with a modern twist as you would find in South Beach. These are authentic recipes as prepared and eaten by the average person in Cuba. The beauty of the tour is the melding of history and stories of the cook, his journey to America, the changing landscape of Little Havana, and the food preparations. If you're wondering if 10am is too early to start a tour--not at all. First I strongly advise to skip breakfast. The tour is a satisfying brunch! The cost is $55/person and lasting 3.5 hours. 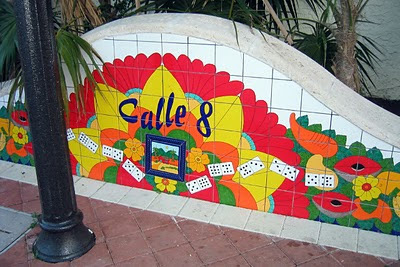 Also, if you do not speak Spanish, then you want to rely on this tour to guide you through the streets of Little Havana. Miami is gaining respect among foodies around the country rivaling cities such as New York, San Francisco, and New Orleans. The Miami Culinary Tours concretes Miami's star on the Avenue of Foodie Fame!